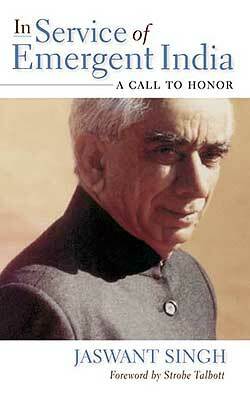 In Service of Emergent India: A Call to Honor. By Jaswant Singh. 359 pages. Indiana University Press. $29.95. India is emerging as an economic powerhouse in the 21st century and Jaswant Singh, the opposition leader in the Upper House (Rajya Sabha) in India's Parliament, illuminates the evolving politics and culture that have led this success and many crises along the way. Singh, an authority on Indian foreign policy and national security, is internationally respected in the world of diplomacy. In "In Service of Emergent India: A Call to Honor," he has written both a memoir of the forces that shaped his life and an analysis of the social and political forces that have shaped the nation he has served since 1996. For perhaps the first time, the book explains the thinking of an emergent nation in relation to nuclear testing and the crisis in 1998, when the United States imposed severe economic and political sanctions on India. As the main foreign policy spokesman for his government, in a situation where India was surrounded by nuclear nations and under no other nation's "umbrella," he articulated India's right to determine their own security needs. He clearly articulates what he sees as the two alternatives—there should be no nuclear weapons and all countries should agree to abolish them, or it should be recognized internationally that all nations have an equal right to protect themselves and possess nuclear arms. Only by making it an open "club" can proliferation be controlled. "In Service of Emergent India" offers a rare look behind the scenes of the world's most populous democracy to reveal a nation of diversity united by economic aspirations and philosophy. What kind of family were you born into and how did your early life nurture the man you grew into? It was a conservative family wedded to tradition, though not blindly, and its value system was subscribed to by all members. Primacy was given to truthfulness, honor, and personal integrity. These may appear somewhat archaic by the norms of the 21st century, and though I was born in the 20th, my upbringing and environment were much more of the early 19th. Having been born and raised in a desert village, I was imbued with an indelible sense of personal pride, self-reliance, and an undying love for the arid regions of the world. In what ways did the partition of India affect your family? We were not directly affected by the partition of the country. The land we lived in was inhabited by a fair percentage of Muslims and was not part of British India. The partition ran through the British territories. We were of course a part of India and remained so. We saw no transfer of population in the desert, a large number of Hindus who had been uprooted in Sind and in Karachi transited through the desert. What did your grandfather mean when he said he wanted you to go to Delhi? Delhi has always been mythologically the center of our political capital or decision-making in India. My grandfather meant he wanted me to go where the governance of independent India was directed. He felt we had suffered living in the remote outreaches of the land so far from the decision-making. Why did you join the Joint Services and at what age? The Joint Services Wing (now evolved as National Defense Academy) is similar to your West Point. It took young volunteers and trained them for two years, whether the boy intended to join the army, navy or the air force. By the time I finished school at 15, our land was taken away by the government. My grandfather was offered compensation but he wouldn't take it. He kept saying, who will compensate us for history? Generations of our family were nurtured by that land. After school, when my father asked me what I wanted to do, I said I wanted to go to university. He said he didn't have the money. So I applied for admissions to the Joint Services and became a cavalry officer. Can you describe India's journey from statehood to nationhood? The concept of a nation state is post-industrial revolution, essentially from Germany. India pre-dates the concept. I believe India is not a territorial but a civilizational nation. We are a civilization and culture made up of a society of many states that have always been one nation. Many languages blend together. It's impossible to explain the concept of a nonterritorial nationhood briefly, though I have attempted this in my book. India's democracy was 20 years old, when you entered political life. Why do you still think of India as emerging? India is still essentially emerging, because what has weighed us down are two and a half centuries of subjugation by the British. I also did not believe in the policies of the early governments in India which went in for excessive centralization [and] state capitalism, curbing the initiative and the creative genius of the country. What did you hope to accomplish when you entered government? We had a program that we had issued before the elections, our joint manifesto of the National Democratic Alliance, of which my party is the principal member. If I had to put [it] in one sentence I would say it was to restore to India its sense of honor, self-confidence, autonomy in decision-making, and freedom for our entrepreneurial genius. We wanted to put more money in the purses of housewives and more food in the bell[ies] of the poor. What were some of the challenges you faced in office? Those six years were the most eventful of the last 50 years of India's independence. There were the 1998 nuclear tests and the resulting international, economic, and political sanctions. We experienced terrorists attacks inspired from abroad. India took a stand that we ought to stop shedding blood and then we were attacked by Pakistan. In this period there were earthquakes, two terrible cyclones, the worst drought in 30 years, and the Gulf War oil prices. In this difficult time, I served in three positions, as minister of foreign affairs, defense, and economics. I'm proud that when I handed over the economy in 2004, we were growing at 8.4 percent of G.N.P. What dangers did the West perceive in India's nuclear program in 1998? With the end of the Cold War in 1989, there came into existence a new nuclear paradigm strategy all the way from Vladivostok to Vancouver. All the countries covered by this phase were either under nuclear protection or were actually nuclear weapon states. It is noteworthy that the N.W.S. were also the P-5, or the permanent five, of the [United Nations] Security Council. These five countries, the United States of America, Great Britain, France, Russia, and China had cornered for themselves the right to own nuclear weapons development but denied it to all on earth. I think the principal apprehension that the Western powers had was not so much India becoming a nuclear power but that this would break the nuclear apartheid they had established. We conducted nuclear tests but also very early on pronounced the doctrine of a credible but minimum deterrent, no first use, and non-use against non-nuclear weapon states. Why did India need a nuclear weapons program? We are the one country surrounded totally by a nuclear neighborhood. In the East we have China, in the West is Pakistan. And there's Russia and Israel, along with America's docile acquiescence to N.P.T. [Nuclear Nonproliferation Treaty] becoming a sanctuary for proliferation. And we are not part of anyone's nuclear umbrella. We ought really to have conducted our tests in 1964 soon after China went nuclear. When that happened the five members wanted it to be a closed club including China but not India. We would not accept that another country would decide about India's security. We are 1 billion in India and we were the first, outside of the Soviet Union, to test a reactor in 1956. But we didn't continue down the nuclear path, because we believed weapons of mass destruction are not war fighting weapons. They are symbols of power and virility. What was the United States' reaction after the test? We managed to test without the U.S. Intelligence Agencies getting even a whiff of what India was about. The West imposed severe economic and political sanctions. They were prescriptive and wanted from India a variety of commitments impossible to give and expect[ed] us to comply as though we were a subject country. India was not in violation of any external treaty, law, or even agreement. How did we respond? We stood up for what we believed to be right. We disagreed with the Unites States of America but we did not have to be disagreeable about it. Our economy was self-contained. We floated a bond globally, which was a huge success. Explain the choices you see, either total disarmament or equal and legitimate global security for all? There are only two choices before the world. Either the world decides collectively, and we agree to the total elimination of all weapons of mass destruction or we accept the principal of equal and legitimate national security for all nations. It must be the nations that decide what constitutes their security. Western countries cannot arrogate to themselves this power. What was your strategy for dealing with the terrorists who hijacked an Indian airplane? Are there lessons for the United States in India's experience? The hijack of IC-814 [Indian Airlines Flight 814; Dec. 24, 1999] from Kathmandu finally to Kandahar in Afghanistan was a most painful episode. It was the worst possible site to deal with the situation. There was not even a telephone connection. And it was Christmas Eve. The world was celebrating, while there were 166 human beings confined in a small space in bitter cold with one toilet. You cannot have a strategy when the situation is changing by the hour. Because the Taliban controlled Kandahar, it was possibly the worst place for India to negotiate the release of its citizens. And we had intelligence saying they would blow the plane up on New Year's Eve for the year 2000, so sitting them out was not an option. They asked for $500 million and the release of 36 terrorists in captivity. Government had a responsibility to negotiate. We broke down the demands to the release of three terrorists by Dec. 31. Of course it is only later that I realized the manner in which the hijack was conducted, using an aircraft as a weapon of destruction, had an uncanny similarity to the subsequent attacks on New York's twin towers and the Pentagon. It was a kind of dry run for what was to come. I shared this view at the time with friends in the U.S. but it is partly human nature that unless you experience the danger yourself, it is difficult to heed warnings. Is Pakistan a true ally of the West? Should the West consider India an equal ally? The hyphenation of India and Pakistan is the root of many problems in the Indian subcontinent. It is essential for the West to decide the nature of its relationship with Pakistan and whether their policy has run into a blind alley. The U.S. planted the seed of the Taliban to serve its interests in the region, wanting to bring the then-U.S.S.R. to its knees. That malevolent energy the Taliban is now turning back to devour those who had created it. I have always shared my apprehension about the Taliban, even with my friends from Pakistan. I fear that Pakistan today is the crucible of global terrorism. The U.S. created a Frankenstein..
As you point out in your book, India has traditionally welcomed a plurality of religions. What is the stance toward Islamic extremists? Extremism is not religion of any kind. Extremists or terrorists should not be identified with faith. Irrespective of what faith a terrorist may subscribe to, a terrorist is a terrorist. In what ways do you hope your book will influence future leaders? "In Service of Emergent India: A Call to Honor" is a distillate of my experience of six years of governance in various ministries of India—External Affairs, Defense, and Finance. This tenure equipped me with a wealth of experience, a great deal of which was devoted to attending to the concerns of the Western powers, particularly the United States of America. I have attempted a broad canvas in my reflections. The book has chapters on the partition of the country, political history, as well as my experiences managing an economy of a nation the size of India. It also captures the beauty of my land and its vivid people. Susan Weinstein is a public relations professional in New York, N.Y. She specializes in book campaigns for publishers.